Great deal at Amazon today! You can save 55% on Twilight Forever: The Complete Saga. Regularly $64.98, you can get the DVD + Ultraviolet Set for only $28.99 (plus qualifies for free Amazon Prime Shipping). The Blu-ray set is normally $74.99 and is selling for $32.99. 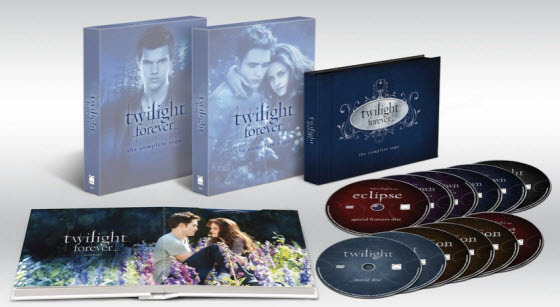 Even if you already have the separate movies, this Twilight Forever Boxed Set makes a great collector’s item plus has so many “extras” that it is perfect for the true Twilight fan. How much shipping to Indonesia? This is so beyond awesome…what a deal!! I paid full price but still love it.